When two of hip-hop’s most accomplished composers get together to make an album you know the results are going to be special. 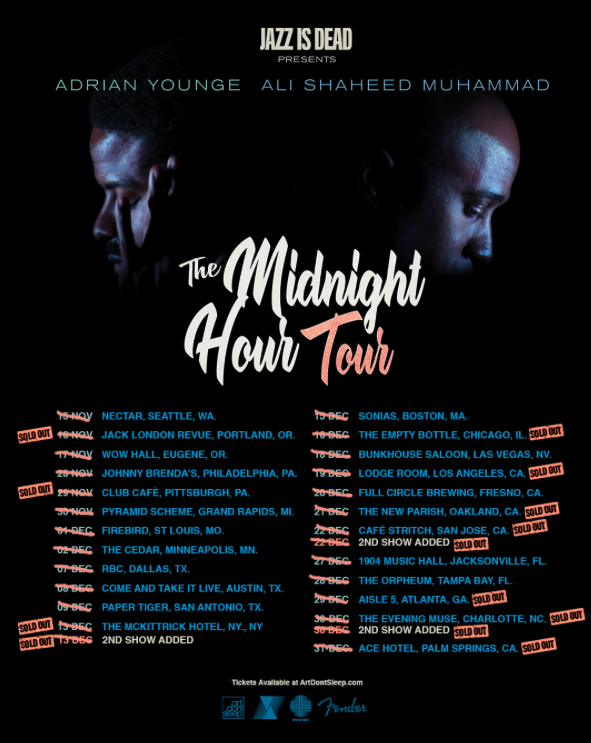 Ali Shaheed Muhammed (of A Tribe Called Quest) & Adrian Younge began their work together in 2013 on the critically acclaimed Souls of Mischief album There Is Only Now and their partnership cemented on their score work for Marvel’s Luke Cage. They are proud to have shared with the world their newest release of their carefully constructed and masterful The Midnight Hour. It is the duo’s long awaited debut album and it showcases their songwriting ability like never before. And, for the first time ever before, the guys have taken this show on the road to tour the U.S. backed by a 10-piece orchestra! Of course they had to make a stop right at home and we were in the building to help curate the show. It was such a great night filled with so many special guest performances such as Estelle, Raphael Saadiq, Peanut Butter Wolf, Danny Holloway, and hosted by well renown author Nelson George. Thank you to everyone who made this night unforgettable. Celebrating 13 Years of Haircuts & Records!